Juan Guaido, the new leader of the opposition-controlled National Assembly, turned up the heat by declaring himself interim president before a mass of demonstrators in Caracas. 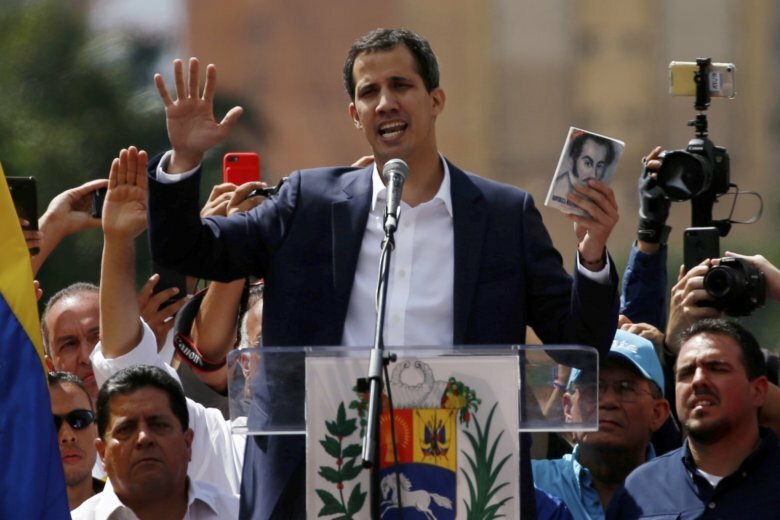 CARACAS, Venezuela (AP) — All eyes were on Juan Guaido’s next step after the popular Venezuelan opposition leader declared he was temporarily assuming presidential powers in a high-stakes bid to unseat Nicolas Maduro, whose powerful loyalists went on the offensive Thursday in support of the embattled leader. Guaido has disappeared from view since swearing before tens of thousands of cheering supporters to uphold the constitution and rid Venezuela of Maduro’s dictatorship, and his whereabouts remained shrouded in mystery. Venezuela’s top military brass pledged their unwavering support to Maduro, delivering vows of loyalty earlier Thursday before rows of green-uniformed officers on state television. A half-dozen generals belonging largely to district commands and with direct control over thousands of troops joined Maduro in accusing the United States of meddling in Venezuela’s affairs and said they would uphold the socialist leader’s rule. Defense Minister Vladimir Padrino Lopez, a key Maduro ally, later delivered his own proclamation, dismissing efforts to install a “de-facto parallel government” as tantamount to a coup. Guaido, 35, turned up the heat by declaring himself interim president on Wednesday before a mass of demonstrators in Caracas. He said it was the only way to end the Maduro “dictatorship” in Venezuela, which has seen millions flee in recent years to escape sky-high inflation and food shortages. “We know that this will have consequences,” Guaido shouted to the cheering crowd before slipping away to an unknown location amid speculation that he would soon be arrested. His whereabouts remained cloaked in secrecy on Thursday. Guaido has said he needs the backing of three critical groups: The people, the international community and the military. While yesterday’s protest drew tens of thousands to the streets and over a dozen nations in the region are pledging support, the military’s backing is far from certain. Much of the international community is rallying behind Guaido, with the U.S., Canada and numerous Latin American and European countries announcing that they recognized his claim to the presidency. President Donald Trump promised to use the “full weight” of U.S. economic and diplomatic power to push for the restoration of Venezuela’s democracy. Meanwhile, many Venezuelans were looking for Guaido to re-emerge and provide guidance on the opposition’s next steps.